With over 40 years experience, Tuff Playstructures is the pioneer of wooden playground equipment as used in South Africa and more recently we again pioneered a range of freestanding wooden structures which have proved very popular in the residential market. Over the years we have developed a standard range of play structures or jungle gyms which should satisfy the needs of most residential or commercial customers. In the event that our standard range does not suite your requirements or space, we will be happy to design and build a custom structure to suite your requirements. Please note that our freestanding range requires a level surface whilst the permanent ranges can be installed on a surface which is not level. Our uncompromising commitment to quality and safety has made us the preferred supplier to many of South Africa’s leading companies and schools as well as a number of high profile international NGO’s. Not only have our structures been installed in all the provinces in South Africa but they can also be found in many countries throughout Africa and even as far afield as the middle east. Our freestanding structures are particularly popular with upcountry customers as they are built in our factory before being disassembled and transported to the customers who then assemble them with the help of our detailed instructions. Leading occupational therapists agree that a play structure is an important tool in a child’s development. Concepts relating to spatial, speed and distance are developed through climbing. These concepts form the basis for scholastic skills. For most children, climbing and gross motor activities are enjoyable — they help to get rid of excess energy, relieve tension and exercise the muscles. Children’s hand eye co-ordination, muscle strength and motor planning are improved whilst engaging in an enjoyable activity. When children play on and gather round a play structure, social interaction occurs. They learn to communicate, to share, to lead and to follow. 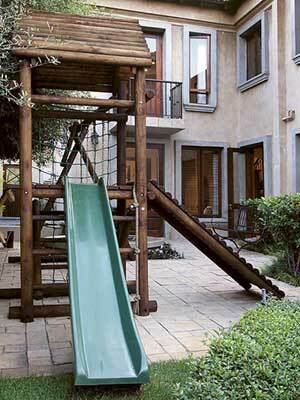 A play structure challenges a child’s ability, builds courage and rewards the child with a sense of achievement.